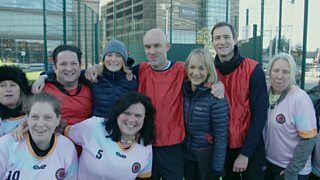 BBC Breakfast's Louise Minchin, who says she has never played a game of football, get to grips with the rules of walking football. Minchin leads a team of BBC All-Stars, including arts and entertainment correspondent Colin Paterson and 5 Live's Rachel Burden, in a five-a-side game against the Rothwell Old Boars. Find out how teams up and down the country get on in the first round of the FA People's Cup - Saturday, 23 & Sunday, 24 February.